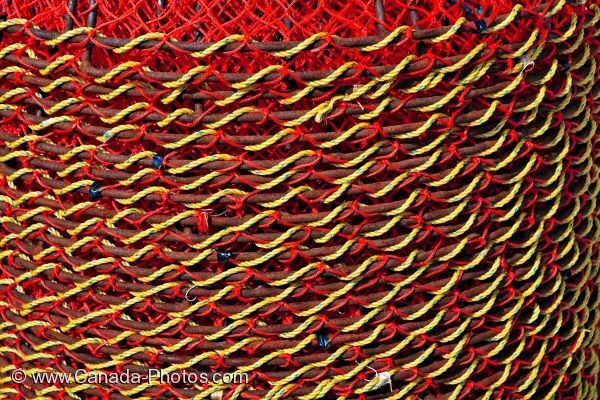 A close up picture of the crab pots on the deck of a fishing boat in Conche Harbour in Newfoundland, Canada. The fishing boat that is fully loaded can not depart until after the pack ice thaws. You can see how each crab pot is made as ropes intertwine around and over each other in order to keep the crab pots fully enclosed. Crab pots on the deck of 'Conche Flyer' a crab fishing boat in Conche Harbour unable to leave the dock because of pack ice, Conche, French Shore, Northern Peninsula, Great Northern Peninsula, Viking Trail, Newfoundland, Canada. Picture of crab pots aboard a fishing boat in Conche Harbour along the Great Northern Peninsula in Newfoundland, Canada.